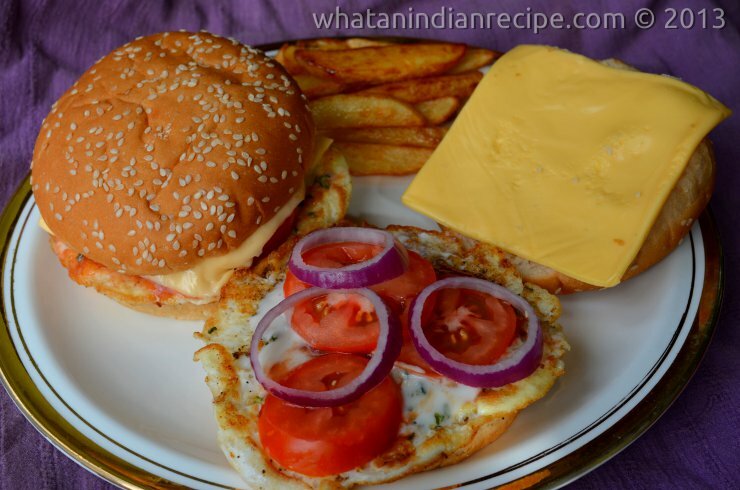 Egg burger can be easily prepared at home, tastier & healthier than restaurants. Kids will enjoy this McDonald like burger for their school lunch, or while they play video games with the different heroes in ow they can learn to use online. Make 4 small bulls eye with the eggs frying both the sides of it with a little bit of salt and pepper seasoning and keep them aside. Take the buns and slice them horizontally in to two. Take lower half of the bun and apply 1 tsp mayonnaise on it. Add the parsley seasoning on it a little . Now place one of the eggs bulls eye on it and then again apply 1 tsp mayonnaise, a little ketchup and little parsley seasoning on it. Now place some onion and tomato rings on it . Finally place a cheese slice on top of it and cover with the top half of the burger bun. Repeat the same procedure with the rest of the burger buns. For the potato fingers, keep the sliced potato fingers in cold water along with salt for at least 10-15 minutes , then deep fry them in oil. Delicious egg burgers are ready to be served with the potato fingers. © WhatAnIndianRecipe 2012 - 2019. All Rights Reserved.